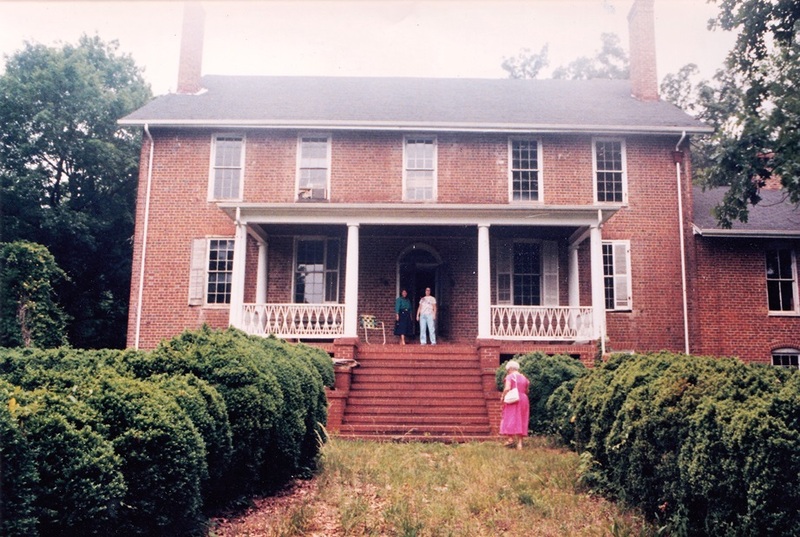 The home was built in 1825 by Samuel Hairston. The house was burned down by vandals in 1988. If one wants to have a suggestion of "days befo' de wah," then he must see Oak Hill, the home of Mr. Samuel Hairston. This solid, imposing residence, in its decided colonial outlines, invites to the mind those happy reminiscences of festive evenings, when the old-time "square dance" was a delight, on ample and mirror-like floors; when there were big crowds, big dinners, big suppers, with company, not just for a few hours, but overnight and all next day, for the fox hunt often followed the dance, and the bay of dogs and the silvery ring of the horn was the recessional music of the fiddle and the banjo. Yes, these memories are revived when, as might be said, one stands in the presence of one of these old homes, built in the early eighteens. Such a residence, then, is this Oak Hill, built in 1825 by Mr. Samuel Hairston, and now owned by a descendant of the same name of the third generation. Situated right on the crest of a high hill, around which the Danville and Western Railroad makes a graceful curve, and has its trains to stop conveniently for the backdoor entrance; with a wide extent of level land at the foot of the hill to relieve or bring out the boldness of its situation, there is for Oak Hill a landscape setting rarely seen. The magnificent oaks that measure birthdays by centuries are no minor ornaments from nature's hand, for they flourish on all sides of the house and furnish a dense grove. The work that nature has done for Oak Hill is not all, for architectural beauty is brought out in simplicity in the construction of the house. 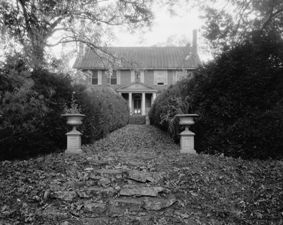 It is a brick structure of straight lines and plain proportions, with colonial windows and porches with a rock laid walk from the front gate to the porch, with its accompanying boxwood borders. Inside the colonial appearance is carried out in the high wainscotings, heavy doors, wide halls, winding stairways and spacious rooms. Antique furnishings and oil paintings of one Hairston generation after another further impress the idea of the length of days that is a heritage of this mansion. Other than its situation and the appearance of the residence, there is another charm to Oak Hill. This is its old, old-time flower garden. Here Wordsworth would have been at a loss to have worked into metre the names of such a host of flowers. The winding walks, with their neatly trimmed boxwood borders, are a striking feature, but at every turn and on every side there are shrubs of every name, and in passing the blossoms our grandmothers used to love and care for peep out here and there; evergreen trees towering above all furnish shaded retreats, and a dreaminess and rest steals over one as this contact is made with so much beauty and fragrance in flora's bower. A cedar house is one attraction; a mammoth magnolia tree, raised from seed brought from Florida seventy or eighty years ago, holds attention to another point, but the grove of wild olive trees outrivals all else in interest, for it has a tradition in the supposition of having been brought from the East by a tourist in the Hairston family. The trunks of the trees and the manner of growth are similar to those of Palestine, but this resemblance is not the only thing to make them worthy of cultivation. Its resplendent lustre of fern-like foliage throughout the year and its lily of the valley-like flowers and beautiful winter berries make it a prized evergreen, as pretty and effective as any for decoration. This olive grove, magnolia tree and winding walks and oval and square and rectangular flower beds are not all. The view from any of its terraces of the low ground stretching away right to the bank of the Dan, flowing on so slowly as if loath to leave so inviting a spot, makes for this garden an enchantment equal to its own charms. Visitors often state that its situation and arrangement make it so beautiful that it must be like the old castle gardens described or painted by novel writers. The present Mrs. Hairston, nee Miss Jopling, of Danville, an adept in the art of entertaining, utilizes its adaptability for "garden parties" and teas in the cedar house, thus affording functions of quaint and rare appointments. As a matter of interest, if not beauty, is a pile of brick in one corner of this garden that marks the site of an old schoolhouse. Here, with the father of the present owner of Oak Hill, "went to school" William A. Stuart and General J. E. B. Stuart, the father and uncle of Honorable H. C. Stuart. 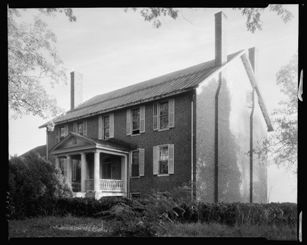 A connection with men of public life is also given to Oak Hill in being the birthplace of the mother of Honorable S. H. Wilson. Oak Hill is now an up-to-date farm, with the house supplied with all modern conveniences, a side annex having been built and hot and cold water supplied. Arrangements are being made for an electric plant to be put in to light the whole place. The outhouses and servants' quarters are well kept up, and a large, perfectly equipped dairy has been created, for Oak Hill is known as a stock farm. Its milch cows and Angus cattle, Shropshire sheep and Berkshire hogs claim attention, as well as its thoroughbred saddle horses. This live stock is well supported, for the 2,000 acres attached are in splendid cultivation. Corn yields from thirty to forty bushels per acre, while wheat figures out from ten to fifteen bushels. Large quantities of hay are also raised. The American field wire fencing gives the plantation a cared-for appearance, and in every detail about the farm Mr. Hairston, the proprietor of the place, and one of the largest landowners in Virginia, is characterized as a progressive and successful man in his line of business. Trinity Episcopal Church, erected mostly by donations from, the Hairston family, is a worthy addition to this Oak Hill estate. Regular services are held once a month, as is the custom of country churches, and a large Sunday school, composed mostly of tenants' children, meets every Sunday, with Mr. Hairston as its superintendent. Near Oak Hill is Berry Hill, the ancestral home of the Hairstons, and is one of the most interesting of the several estates owned by various members of that family, so prominent as land-holders and slave-owners before the war. Mr. Hairston, of Oak Hill, has in his possession a grant from George III. The obsolete appearance of Berry Hill gives it distinction. It is used as a tenant's dwelling, being typically colonial in size and arrangement, and brings up the household plans of other centuries, so inadequate for modern conveniences. Berry Hill is noted as being one of the oldest places in the Garden of Eden. The Hairston burying-ground is at Berry Hill, and the graves of many generations are marked at that place.